Striving for simplicity in weeknight cooking doesn’t have to mean simple flavours. For me, every meal must count and every dish must deliver on taste and heart. This recipe shows how one humble ingredient, carrots, can spearhead an easy-to-prepare, flavour-bursting dish. Using carrots from top to tail reduces waste and also challenges our taste buds. Carrot tops are herbaceous and earthy, with just a hint of carrot flavour, and add a surprising herbal accent to salads and sauces like pesto and hummus. For dinner prep, a bunch of carrots can go a long way. The lush green flavour of carrot tops makes them the perfect addition to chimichurri. On a recent trip to Argentina, upon busy tables replete with carne asada (grilled beef), Malbec wine and oversized Coke bottles (an Argentinian tradition, I’m told), I salivated over the jars of chimichurri, herbier and heavier than usual. Dramatically tinged with paprika, and embellished with chunky chopped herbs and tiny specks of tomato, this Argentinian version of the sauce brought an exciting brightness to my plate of vegetables. In my twist-on-chimichurri recipe below, carrot tops are a lively replacement for the more traditional parsley. 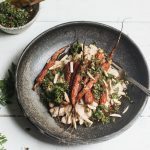 This dish of roasted baby carrots with carrot top chimichurri, served on a bed of smashed white beans, comes together in about 30 minutes, and effortlessly shows off the flavour possibilities of simple ingredients. The recipe comfortably serves two, but if you are cooking for more, just up your carrot and bean count. No need to increase the amount of ingredients for chimichurri, as this recipe makes about one cup, more than enough for extra mouths. Keep extra chimichurri in an airtight jar in the fridge for up to 14 days. The chimichurri can also be made ahead to allow the flavours to meld. Scrub the carrots well and pat dry. Lay them out on a baking tray and drizzle with olive oil. Season with sea salt and black pepper, and roast for 20-25 minutes, until tender and golden (this time may vary depending on the size of your carrots). To make your chimichurri, place the chopped carrot tops in a small bowl. Add the oregano, tomato, garlic, cumin, both paprikas, chilli flakes, olive oil and vinegar. Stir to combine. Season well with 1-2 teaspoons of sea salt and a good turn of black pepper. Taste and adjust seasoning to your liking. For the smashed beans, place a small clove of garlic in a mortar, sprinkle with some sea salt and pound it into a paste. Add the beans and pound until half of them are broken up but the consistency is still chunky. Stir through 2 tablespoons of olive oil (or more), and season with sea salt and black pepper. To serve, place the smashed beans on to a plate and top with the roasted carrots. Spoon over some of the chimichurri and scatter with slivered almonds. The world over, people make delicious things you can eat with your hands, and one of my favourites is the Mexican gordita – ‘chubby’ in Spanish . It is traditionally made with masa dough, but I have used more readily available cornmeal and topped it with beer-infused beans, beetroot pickles and a sprightly avocado cream. There are four elements to this dish, but don’t let that put you off. The pickles and avocado cream are fairly quick to make and both those and the beans can be made in advance. Heat the olive oil for the beans in a medium-sized pan over a low heat and, when hot, add the chopped onion and garlic. Cook for eight minutes, until translucent and starting to caramelise, then add the jalapeño, salt, oregano and paprika. Stir to coat the onions, then cook for four minutes to soften the jalapeño. Add the beans to the pan, stir to combine, then increase the heat to high and add the beer. Bring to a boil, reduce the heat to low and simmer for 30 minutes, stirring occasionally. Meanwhile, prepare the pickles and the avocado cream. For the pickles, combine the beetroot and sliced cabbage in a small mixing bowl and add the vinegar and salt. Mix well so that everything is coated, and leave to pickle for 30 minutes. For the avocado cream, combine the avocado flesh, vinegar, oil and salt in a blender, and blitz for one or two minutes until completely smooth. Depending on the ripeness of your avocado, you might need to add a teaspoon or two of water to get a silky mayonnaise like texture. Finally, the gorditas. Mix the cornmeal, flour, salt and baking powder in a large bowl and make a well in the centre. Add the water a little at a time, using a spoon to bring the dough together each time. Once all the water is added, bring the dough together with your hands, knead into a smooth ball and rest for two minutes. Divide the dough into 12 even balls, each weighing around 50g, and roll each out on a lightly floured surface until you have a pleasingly chubby disc of dough roughly 5mm thick. Fry the gorditas in batches in a heavy-based frying pan over a medium heat – two or three to the pan at a time, depending on the size of your pan. Fry the gorditas for two minutes a side, until crisp on the outside with no dark doughy spots. To serve, top each gordita with a spoonful of beans, some avocado cream and a pinch or two of pickles.